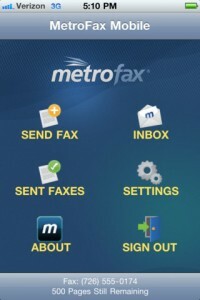 MetroFax offers a free app for iPhone users to go along with its MetroFax account. The Essential plan comes with 500 combined pages and costs $7.95 per month. With the MetroFax app, you can address faxes by using the contact information from your phone. When sending a fax, you can easily add a cover page or attach documents, as well as preview your fax before sending it out. You have the option of sending faxes from your device or you can access your files from services such as Dropbox, Google Docs, SugarSync and Box.net. You can also send a fax-optimized image from your phone’s camera. The app helps you keep track of your fax page balance for the month. In addition to the iPhone, the MetroFax app is available on Android. Read our review of MetroFax’s desktop online fax service. 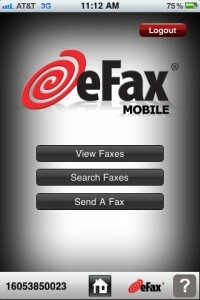 The eFax iPhone app is free for users with an eFax account. The eFax Plus plan costs $16.95 per month and comes with 150 incoming and 150 outgoing pages. This app allows you to create and send faxes by taking photos of the documents you want to send, enhancing the images, and then faxing them. You can also search for and view all of your received faxes. With this app, you can create customized cover sheets and use your iPhone contact list to address faxes. This app had some functionality problems in the past, but these issues have been resolved with the new version. Faxes can be marked with search tags to make them easily accessible at a later date. You have the option of forwarding your messages as a fax or an email. This app is also available for the Android. Other online fax services that offer an iPhone app include MaxEmail, MyFax and RingCentral.